While Hans is absent a couple of days, recovering from a hand surgery, I have promissed to fill in entries on subjects of mutual interest. Today I'll add a little info on the cavaquinho to make a follow-up of the discussion regarding the recordings by the Asmussen Quintet yesterday. The cavaquinho is a small string instrument (like the ukulele) of the European guitar family with four wires or gut strings. It is also called machimbo, machim, machete (Portuguese islands' and Brazilian designation), manchete or marchete, braguinha or braguinho and cavaco. The most common tuning is D,G,B,D (from lower to higher pitches); other tunings include G,G,B,D and A,A,C#,E. Guitarists often use D,G,B,E tuning to emulate the first four strings of the guitar. Anyway, to cut off a long and complicated story, the cavaquinho is most often connected with the Brazilian music tradition - like the bandolim, which is the Brazilian issue of the European mandolin. The cavaquinho is a very important instrument in Brazilian music, especially samba and choro. The standard tuning is D-G-B-D. Some of the most important players and composers in the instrument's Brazilian incarnation are Waldir Azevedo, Paulinho da Viola, Alceu Maia, Mauro Diniz and Paulinho Soares. The samba cavaco is the connection between the rhythm and harmony sections, playing the rhythm comping. It's played with a pick, with sophisticated percussive strumming beats, but it may also be used as a solo instrument in choro ensembles. The cavaquinho is also found in other places where the Portuguese made an imprint, namely Cape Verde and USA (especially Hawaii), and also here it became an important part of the typical music of those places. The Hawaiian ukulele has four strings and a similar shape to the portuguese cavaquinho. 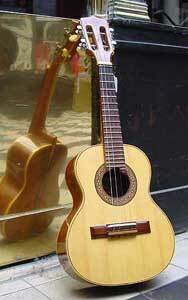 The cavaquinho was introduced in Hawaii in 1879. The cavaquinho is a magical instrument. I know someone who is a master with it. His name is Salgadinho and here is a video of him playing (he is also introducing his new cavaquinho).